Can Afghanistan’s Unity Government Be Built to Govern? The transfer of power on September 29 from President Hamid Karzai to his successor Ashraf Ghani was momentous but oddly anticlimactic. It was only possible after a highly controversial presidential election between Ghani and former foreign minister Abdullah Abdullah, which brought the country to the brink of chaos. Abdullah refused to recognize the results, which gave Ghani an overwhelming second-round victory. 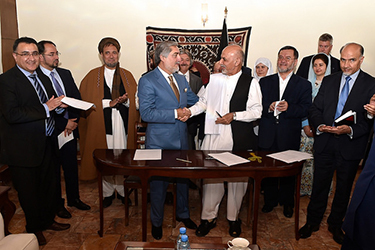 The United States negotiated a power-sharing deal where Ghani would become president, but a “chief executive officer” position would be created for Abdullah. The deal also prescribed an audit of the election supervised by the United Nations to identify and remove fraudulent votes. It was a bad sign that the September 29 inauguration was almost derailed at the last minute when Abdullah objected to the fact that the results of the election audit were released. The post-audit results have Ghani winning with 55 percent. Abdullah has accepted the ultimate verdict of the electoral authorities—that Ghani won the election—but has otherwise rejected the legitimacy of the election, claiming that the audit failed to remove most of the fraud. In the end, he agreed to share the inaugural stage with Ghani, bringing the electoral crisis at least to a close. The question now is whether this unity government can survive the fractious conditions of its birth, or whether the power-sharing deal will simply institutionalize the distrust between the two camps. The latter would be tragic. The electoral dispute imposed a huge cost on the country. Government revenues fell and the new government has inherited an empty treasury. The Taliban took advantage of the leadership vacuum in Kabul to step up their insurgent campaign. The electoral dispute itself severely tested Afghans’ confidence in their leaders and their political institutions. Luckily, the two sides agreed on the most immediate order of business—the signing of the Bilateral Security Agreement with the United States, which took place on Tuesday. The agreement, painstakingly negotiated between the two governments in 2013, sets the legal terms for US troops to operate in Afghanistan beyond 2014. President Karzai, in a surprise decision last November, refused to sign it, insisting that it was the responsibility of his successor. The extended process of determining who the next president would be brought the situation dangerously close to the point where the US would begin withdrawing all its troops this year. Tuesday’s signature removes that fear, guarantees US direct military support to the Afghan security forces at least until 2017, and will hopefully re-inject confidence in this crucial bilateral relationship that has been badly tarnished during Karzai’s final years. There is likely to be less agreement between Ghani and Abdullah on the next order of business: naming the cabinet. Part of the functions of the CEO are to provide “advice and proposals to the president for appointment and dismissal of senior government officials.” How this works for ministerial appointments is not clear. For international donors, the quality of ministers appointed to important ministries (such as finance, defense, and interior) will be a critical factor in determining future financial support to Afghanistan. A major test of the viability of this government will be whether Ghani and Abdullah can agree on appointing reform-minded ministers. There is a four-part dilemma: each candidate has campaign favors to repay to powerbrokers; powerbrokers are not necessarily technocrats; ministries important to donors are also prestigious to powerbrokers; each side has fewer posts to distribute given that the government is shared. The only way to resolve this dilemma is by cooperating on mutually-acceptable competent ministers, even if that means foregoing patronage-based appointments. It would be especially unfortunate if the logic of power sharing led to a cabinet of cronies. One of the few positive developments during the electoral standoff was the ability of both teams to quickly agree on a general reform program for Afghanistan’s future. If a competent cabinet can be put in place, it will be much easier to implement this reform program. Even under the best of circumstances, however, the power-sharing deal includes several provisions that will distract from the governance agenda. These provisions concern the agreement to amend the constitution within two years in order to formalize the powers of the CEO. This means convening a national assembly, or Loya Jirga, that includes representatives elected at the district level. So far there have not been district council elections in Afghanistan because district boundaries have not been delineated. Also, in order to avoid the sort of electoral dispute that occurred in 2014, the two sides have agreed on electoral reforms, including the creation of an electronic database of voters and national ID card. These are huge tasks that will need to be completed in a very short time. An agenda of this magnitude has little chance of succeeding if the government does not devote its full, concerted energy to it. Afghanistan emerged from a political near-death experience after the summer of 2014 and managed a peaceful handover of power. But it is too early to know whether the political crisis is over, or whether it has simply entered a new and more complicated phase. Its first decisions will be watched closely by both its friends and enemies. Afghanistan’s two new leaders need to be aware that how they act in the next few weeks will play a large role in determining whether support will be offered by the former or vulnerabilities will be exploited by the latter.